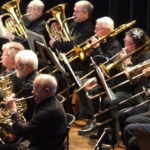 Founded by Jim Perkins in 1969, the Chatfield Brass Band started as a strictly male brass band and eventually became a full concert band that also included women. For nearly 50 years, the Chatfield Brass Band has maintained a rich tradition of community concerts and parade performances. Our members range in age from 20 to 85 and hail from 15 communities throughout SE Minnesota. We strive to give our members the experience of performing many types of band literature from classical to marches to musicals. In addition to an eight week “Music in the Park” summer concert series, the band performs throughout the year in area parades and concerts, sponsors the Western Days Friday Night Jam, and presents a community Holiday Concert on the second Sunday of December. In June of 2000, the band and City of Chatfield dedicated the Chatfield Band Shell in the centrally located city park, built with $81,000 of community donations. Although the band has always performed concerts in the park, the band shell allowed a full summer concert series to become a reality. The Chatfield Brass Band, Inc. also operates the Chatfield Music Lending Library. The library has an immense catalogued collection of band, orchestra, and sheet music that they lend to the public. The music lending library gives the band a unique opportunity to perform classic band literature that may be out of print and unavailable elsewhere. Read our latest newsletter. Carmen Carter Narveson has directed the band since 1999. She is a retired music educator with 38 years of teaching experience. She currently gives adult music lessons, works part time at Mayo, directs church choir, and is active in many community organizations. Read the article Carmen wrote for the last newsletter. Get to know your fellow staff and board members of the band! Board terms are for two years with elections taking place in January of odd years.